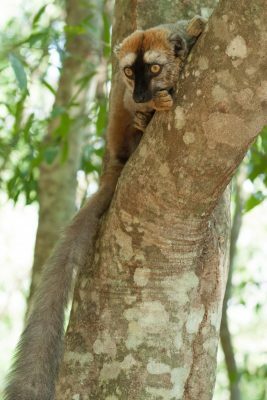 After volunteering at Sainte Luce Reserve for two weeks, I wanted to explore more of Madagascar and photograph different lemur species. I booked a stay at Berenty Reserve for two days since it was only a few hours drive from Fort Dauphin. 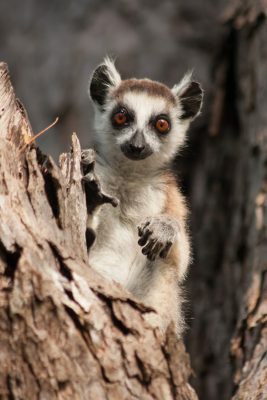 I had also read in my Madagascar guide book that it’s where a lot of National Geographic footage of lemurs has been taken so I was very excited for my two days there. The morning of my departure from Fort Dauphin a private car and my private guide arrived promptly on time to pick me up. You need a guide with you at Berenty, visitors aren’t permitted in the forest without one. The drive took about three hours and we stopped at a market along the way to buy some bananas and some hand-woven baskets that I really wanted. I saw very few cars along the drive, mostly locals walking miles to bring their wares to sell in the closest market or even going as far as Fort Dauphin. 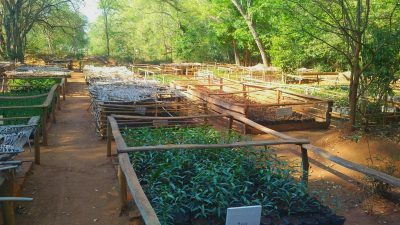 Once at Berenty, I quickly realized that the climate is very different from that of Sainte Luce Reserve. It’s much hotter and more desert-like with beautiful red soil. 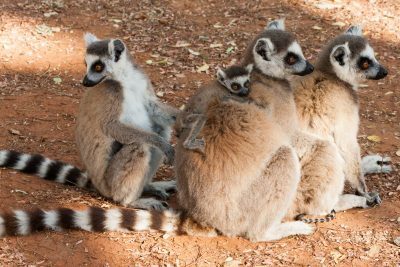 I had a gorgeous bungalow and as soon as I arrived I saw a troop of ring-tailed lemurs with their babies lounging on the neighbouring bungalow patio. I took some pictures of them, and even a selfie or two. 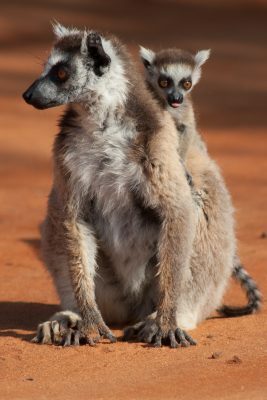 Photographing lemurs was a dream at Berenty. Walking in the woods we often came across multiple troops of different lemur species all within close distance of each other. 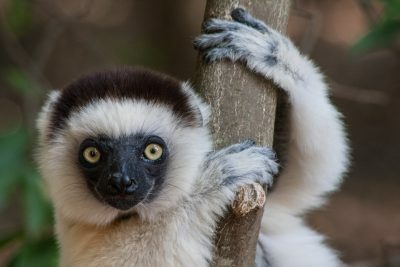 It wasn’t uncommon to be photographing a sifaka and have a ring-tailed walk down the trail or see red-fronted brown lemurs in the trees on the other side of the trail. 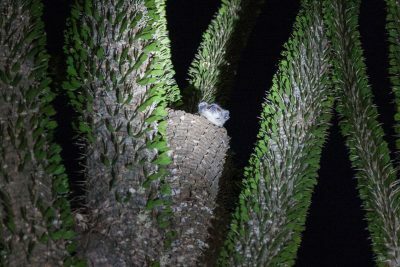 I also got some great photos of a nocturnal sportive lemur hanging out in a tree during the day. 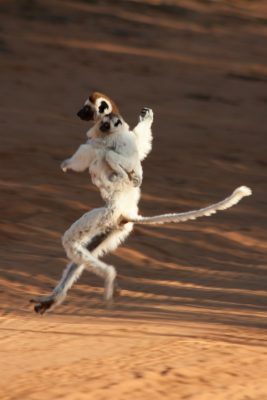 I saw the dancing sifakas which was a real treat. They don’t walk on the ground on all four legs like other lemurs, they hop on their back feet. 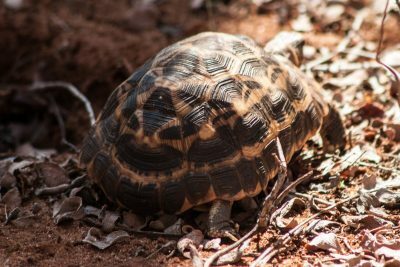 In the evenings, they cross the main road and if you wait there you’ll get to see them dance across with the red soil as a backdrop. 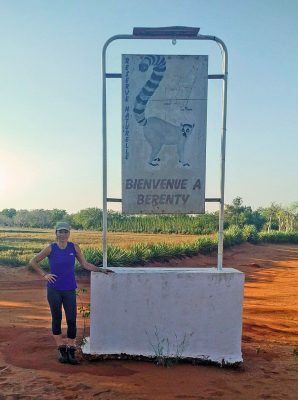 The lemurs at Berenty are used to people and are very curious, especially the sifakas. I had one who almost reached out to touch me and when I eventually moved on, she followed me for a few minutes. One time at dinner, a ring-tailed lemur jumped up on my table and started drinking my smoothie! Another time, one started going through my backpack on my bungalow patio trying to find a banana I had hidden in there. He didn’t find it but it was quite comical. Both nights that I was there my guide took me on a night walk through the spiny forest. 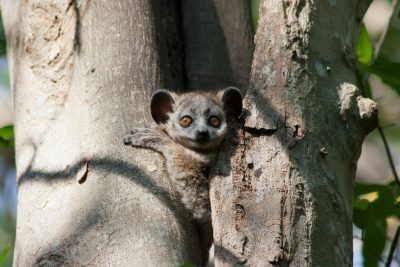 We saw several sportive lemurs and a few mouse lemurs. I really loved the spiny forest with it’s cacti-like vegetation and majestic baobob trees, it was so unique. 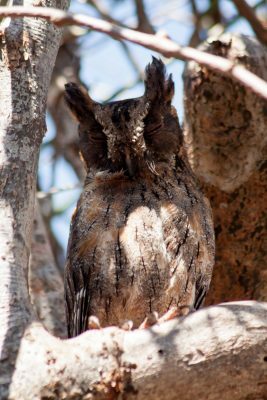 During the day walks, along with sifaka lemurs, I saw a Skups owl sleeping in a tree, chameleons, an iguana, and a spider tortoise. Overall, I ended up seeing six different types of lemurs in only two days. My favourites were the sifakas. 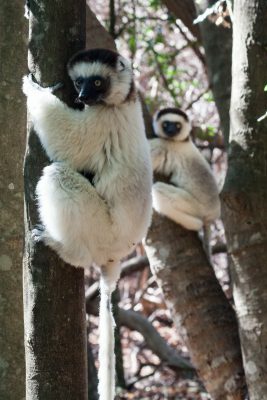 The sifakas were so beautiful with their white fur and their adorable faces. The ring-tails had the most gorgeous fluffy tails and are probably the most popular lemur species, but for me the sifakas were the ones I was most interested in. I loved my time at Berenty! I wished that I could have stayed longer but it’s expensive to stay there, and I had to get back home as the journey back to Canada is a long one. I would definitely recommend going to Berenty if you have the chance, you’ll get once in a lifetime photographs and memories!